Cristal de Musc is a perfume by Comptoir Sud Pacifique for women and was released in 1986. The scent is powdery-floral. The production was apparently discontinued. 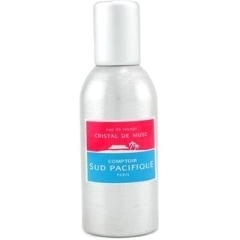 Comptoir Sud Pacifique CRISTAL DE MUSC is an incredibly light but very pleasant clean musk skin scent. It has a very tiny bit of sweetness and actually smells like a baby's freshly bathed bottom. Or maybe like the idea of that image. The scent is definitely not that of baby powder or diapers (à la Kenzo FLOWER or the many laundry musk scents out today), but that of clean skin. This would be the perfect perfume for people who hate perfume--were they for some reason, under some bizarre circumstances forced at gunpoint to don what they take to be the evil substance--but it can also be used as a base, to give more complex compositions with poor longevity a bit of staying power. The scent is so light that there's no real way that it can conflict any other perfume, it seems to me, although it does have just a touch of sweetness to it. Write the first Review for Cristal de Musc!